← Northern New Jersey vs San Diego, CA in February: And Your Choice Is? Is Sunny the VW Bug going to have company in the doghouse around here? It was about 48 hours after my son Max and I picked up his new (used) Subaru Forester from a fellow in New Hope, PA. Max drove the vehicle back to Big Ten College without incident on Sunday, only mentioning that the gas pedal was a little wobbly. On Monday Max called and said that the windshield cleaner system (affectionately called the windshield washer squishy thing in our home) wasn’t working. He said that the Auto Zone guy said the pump might be bad. In the meantime, Max purchased three new windshield wiper blades to replace the shredded ones on the Subaru. Tuesday morning Max called and said that the windshield repair company came out and fixed the two small dings in the windshield of the Subaru. He said that the car was working fine except for the windshield washer squishy thing and the little wobbly gas pedal. No, NO, NO! Not another lemon car in our house!! Tuesday night Max called and said that two lights were lit up on the Subaru’s dashboard: “battery” and “brakes.” He said that he would call the seller after he got out of class last night. I recalled that the seller said he had replaced one set of brakes and the battery on the Subaru. I’ve had my fingers crossed that somehow the on-board computer (does the Subaru have one like the Audi and VW do?) was not properly reset. I don’t want to think of the alternatives. My husband Mike called from San Diego, CA last night and said he had talked with Max about the Subaru’s issues; Max had called the seller and Max was going back to AutoZone for a battery cable and brake fluid. That’s what the seller asked him to do. I haven’t heard from Max today. . .yet. Honestly? 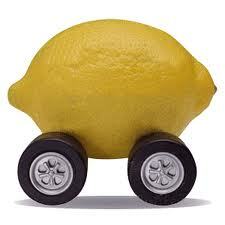 I think we got us another lemon car, but then I’m about “carred” out. Can you cross your fingers for us? P.S. My 15-year-old treadmill bit the dust and I just found out the company stopped making replacement parts for it two years ago. Planned obsolescence: Curse words to me.